What do cobalt, uranium, helium, titanium, and fluorspar have in common? 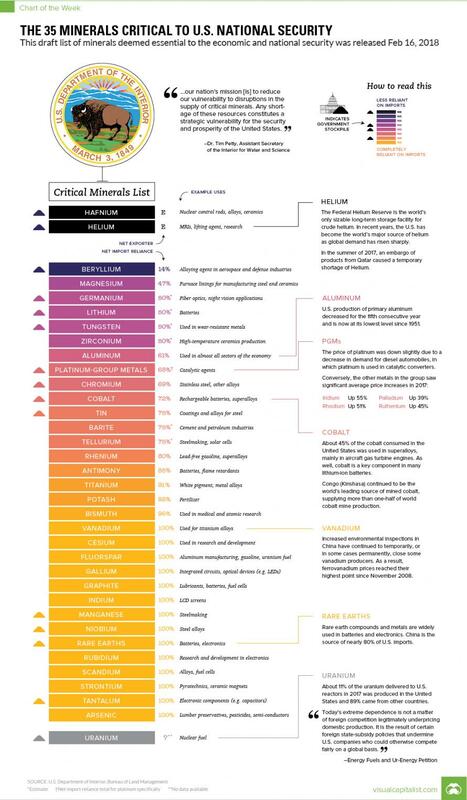 As Visual Capitalist's Jeff Desjardins points out, according to the U.S. government, these are all minerals that are deemed critical to both the economic and national security of the country. The draft list of 35 critical minerals was released on February 16, 2018 as the result of President Trump’s Executive Order 13817, which asked the U.S. Department of the Interior and the Secretary of Defense to publish a list of mineral commodities that are vital to U.S. interests. The list includes minerals that are important for defense, economic, and industrial purposes – and it keys in especially on minerals that are not produced in substantial quantities domestically. We sorted the list based on some of the key uses of these minerals. 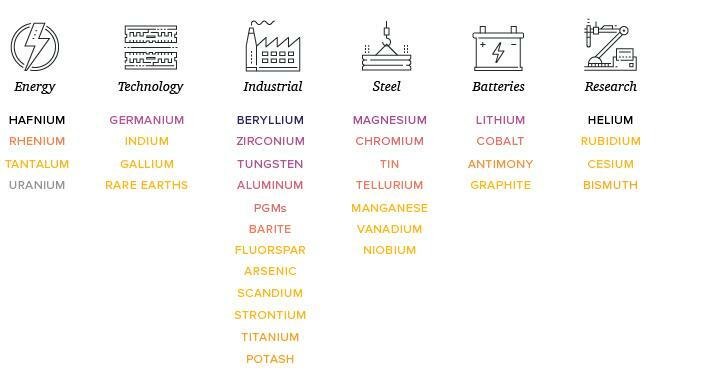 Of course, some of these minerals could belong in multiple categories: for example, vanadium is used as a steel and titanium alloy strengthener, but also in rechargeable vanadium flow batteries. That said, the important commonality to note for all of these minerals is their crucial link to the U.S. economy and national security. Imagine the hypothetical impact of a lack of uranium for nuclear plants, a hampered ability to create high-strength steel and superalloys for the U.S. military, or if U.S. auto manufacturers had limited access to aluminum, steel, PGMs, and battery metals. The challenge, as U.S. federal authorities realize, is that many of these raw materials are produced in limited amounts domestically. In fact, according to the USGS, the country sources at least 31 of the aforementioned materials chiefly through imports. While it is unlikely that these supply chains would ever be disrupted, it’s never a bad idea to prepare for the worst-case scenario.